So rather than try to write a description about the numbers I decide to draw up a chart. 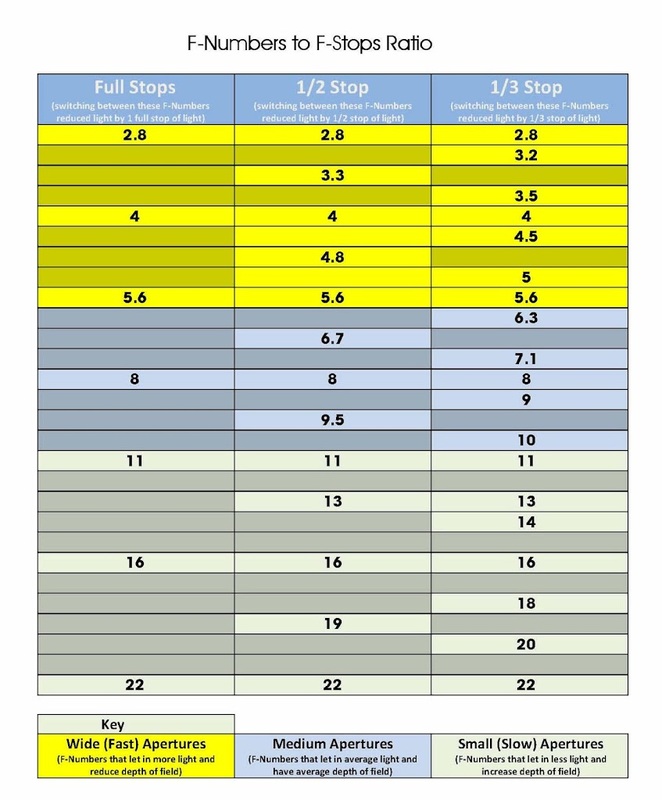 The chart is pretty simple to understand, along the top are 3 columns, starting with Full Stop, 1/2 Stop then 1/3 Stop, reading down each column you see the camera F Numbers. The gap between the F Numbers is the amount of light you are reducing or increasing into the camera. Lets say you want to reduce the light by 1 Full Stop of light, simply look at the first column titled Full Stops and switching the F-Number on your camera between these settings will decrease or increase the amount of light accordingly. Using the second column and switching between these F-Numbers will reduce light by 1/2 Stop and finally switching between the F-Numbers in the 3rd column will reduce light by 1/3 Stop. I hope this all makes sense, any questions just let me know in the comments. As its that time of year again, and the nights are drawing in and the clocks have changed. I thought I would have a bit of a play with something I have never tried before. 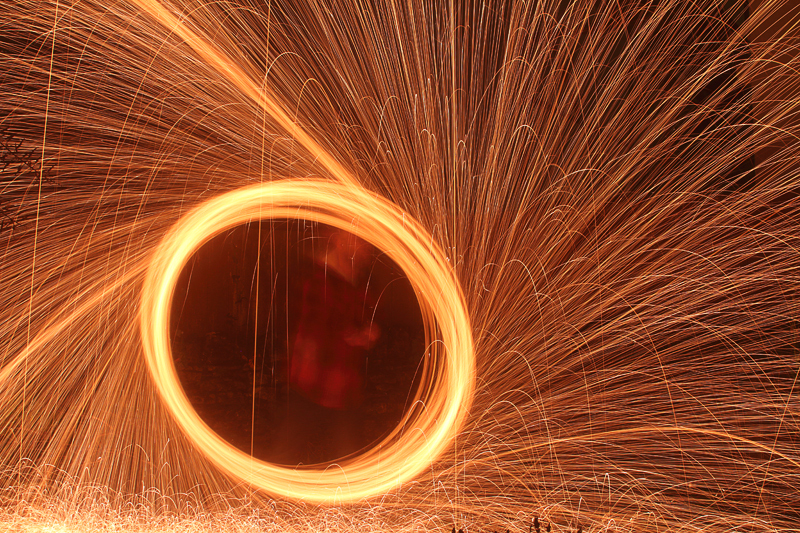 Shooting with long exposure steel wool, and I think the results for my first try are not too bad. I will play around with it a bit more and add my creative spark (lol) to it and I know its something I am going to love playing around with. Not too bad for my first attempt. But a few works of caution. Always wear clothing that covers all your body, including a hat and gloves. 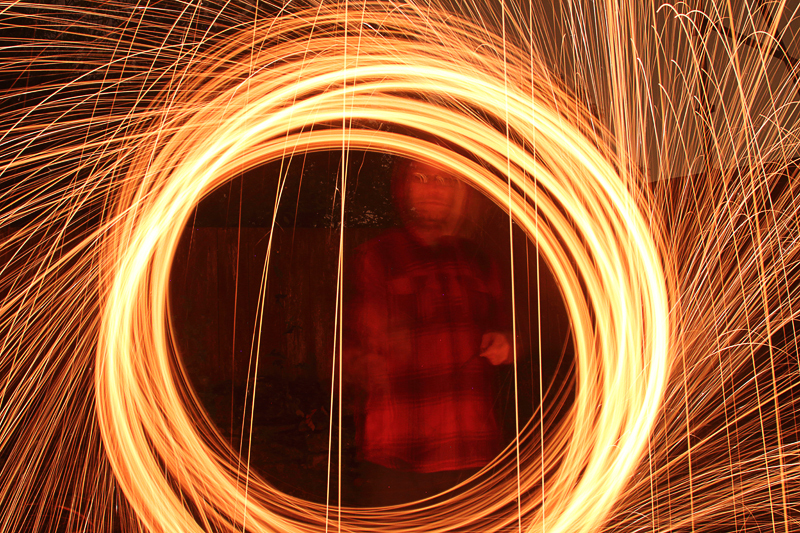 The sparks can get really hot. Carry a fire extinguisher or have some method to tackle fires. So I will continue to play with this and post back my shots. Being the photographer that I am, I get a lot of people asking me what type of camera they should get, and more often in todays climate, why should they even buy a camera at all. Especially when their mobile phone has a camera and it has a massive? 21 mega pixels, where as a DSLR may only have 16 mega pixels. On the face of it, you may think they are right. Surely having 21 mega pixles or 21 million pixels is better than only having 16 mega pixels or 16 million pixels!! The answer is a very simple NO!! The problem is with the two main elements that are the basis of photography and these are light and drawing as in the word itself. So having a good quality photograph requires that you maximise the elements involved to produce the best results. In order to get a good photograph you need the right amount of hitting the sensor (more on the sensor in a bit). This means having a lens that allows the most light in so it can create your photo. This is where one of the mistakes people make in comparing mobile phones with actual cameras comes in and that is the F Number of the lens (check out my article about F Numbers). In most cases in order to maximise the light into the lens you need a large aperture and a fast lens, this usually takes the form of a lens with a low F Number something like an f/2.8 on the new iPhone 6s. So you will be thinking, thats great my new iPhone has the same F Number as a more expensive camera lens, so why do I need to buy a camera. Simple – Not all lens are the physically the same size. 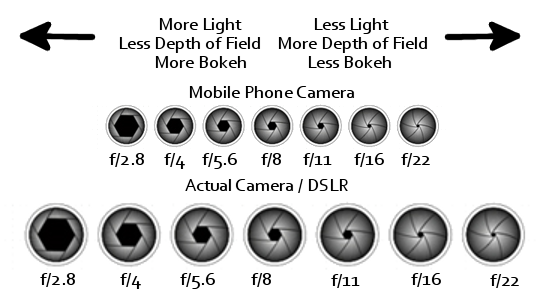 As you can see from the diagram above, the F Numbers on the mobile phone cameras can be the same as those on a DSLR camera, However as you can clearly see the actual lens opening (aperture) is different. Put simply the DSLR lens has a larger diameter and as such even set to the same F Number will allow a lot more light in and therefore a lot more lights hits the sensor. The next important element in taking a good photograph is the drawing (graphy) or information stored during exposure. 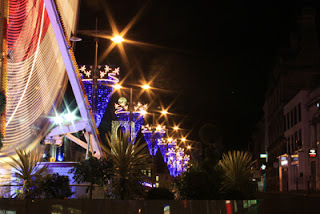 This leads to one of the biggest mistakes in comparing mobile phone cameras and DSLR cameras, and that is mega pixels. A mega pixels is simple an area of 1 million pixels that captures the information during exposure of a photography, so generally the more mega pixels the more details and the higher resolution the shot you will take. This is where it gets interesting, not mega pixel is either the same quality or the same size. 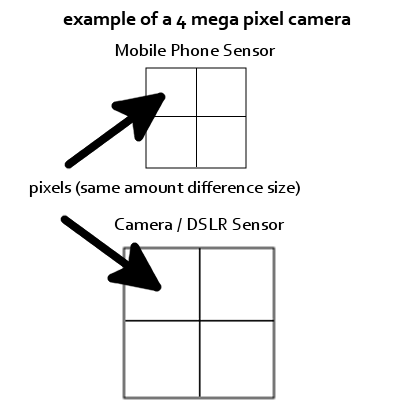 The sensors used in most modern mobile phones are way smaller than those used in modern DSLR cameras. As you can see from the simple diagram above. If we take a 4 mega pixels mobile phone camera and compare it to a 4 mega pixel DSLR you can clearly see the size of each mega pixel is larger and in turn the size of the pixels inside are larger. So we get 4 million larger pixels in our DSLR as opposed to 4 million smaller ones in the mobile phone. This means that we get more information stored and more detail in the photograph by the DSLR compared with a mobile phone. In modern day mobile phones and DSLR the technology has dramatically improved, this means it is possible to take decent photos on a mobile phone in low light, this is due to additional factors such as the actual sensor type and camera chips used in processing the photos. However, the same rules apply, no matter how much jiggery pokery you get from technology, the DSLR will always produce better photos. However even the sensors in DSLR cameras are of a difference type and size, but more on that later. What does the F Stand for in F Number and F Stop? The F in F Number, F Ratio or F Stop stands for Focal Length. Focal length is simply the size of a lens or a given point on a tele-photo lens such as 50mm, 100mm, 300mm. What are F Number / F Ratio and F Stop? Although many people use the these to mean the same thing, they are in fact different things all together. To put it simply they are. F Number / F Ratio is simply the ratio of light entering the lens aperture to the focal length of the lens. So in order to gauge the F Number and the size of the aperture and available light, just divide the open aperture with the focal length of the lens. 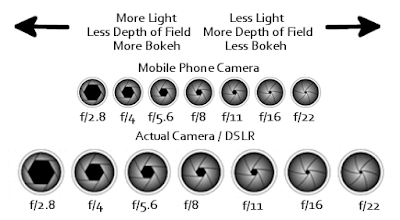 As you can see from the diagram above, the larger the F Number the less light allowed to enter the lens and the more depth of field you get (more of the frame will be in focus and less Bokeh). A measurement of light, the current light level in your situation is always classed as 0, reducing the light level is known as stopping down, so if you decrease the amount of light by the same amount of light available, you have stopped the light down by 1. As every good photographer will know the word photography actually means “writing with light” and this means that one of the most important things you can get right in order to get a great photograph is the lighting. Lighting comes from two main sources ambient and artificial, and being able to control your lighting is the key to your photos being great rather than good. This is very simple to understand but difficult to master, ambient light is using the light from available light sources that occur naturally in your environment, this can be light from street lighting, light from the sun, the moon or anything else that is around that you do not have direct control over. The simple fact that your do not have direct control over ambient light means that you have to use otherways to bring some form of control to the lighting. The most common way to control ambient light is with a reflector / diffuser, this small or large piece of kit allows you to reflect the light to exactly where you want to, and some reflectors are multi purpose and have an in built diffuser which allows you to scatter the light more evenly across your subject. 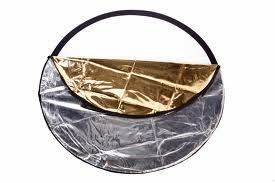 Directly reflects the light to where you want it, normally done using the silver side. Reflects the light but softens its colour, normally done using the white side. Remove light from your subject by absorbing it, normally done with the black side. Now although a reflector is the most common tool used to control ambient lighting, you can pretty much use anything you like to get the desired effect, even closing curtains is a way to control ambient light in fact you can just play around with everday objects to give you the right lighting. Althought this may sound obvious the best way to play around with ambient or available light is to change the camera setting, this may mean using a smaller or larger aperture or changing the shutter speed, by adjusting in camera setting you can also control directly the ambient light entering the camera to get the desired effect. Hgher ISO number will give lighter photos, but also add noise to your shots. 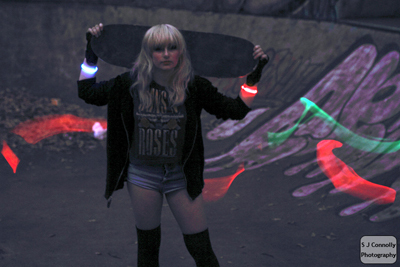 As you can see in the example above by using a slower shutter speed the ambient light can be made to look really cool. So remember that the only limit is your imagination so go nuts. When time calls for it and the ambient or available light is insufficient for your needs there are two main choices when it comes to lighting your subject, flash / strobes and continuous lighting. A flash / strobes is the common term for a portable unit that provides light directly in connection with your camera shutter, these come in all shapes and sizes but have common features and functions which I am going to talk about here. Ok I will start by giving you an over view of the most common function on modern flash units, I will start at the bottom left of the diagram and work clockwise. 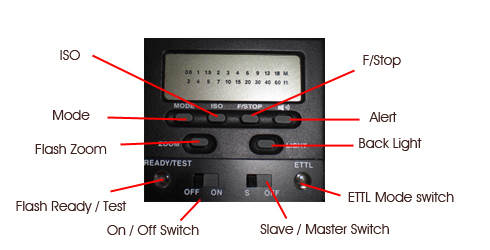 This switch is used to turn on or off the flash unit, when switch on the flash will normally make a high pitched sound until it is ready to fire. This button has two purposes the first is it will light up when the flash unit is ready for use, the second is that when it is lit up it can be pressed in order to test fire the flash. This button is used when the flash in in manual mode to zoom or move the flash head inside the flash, this allows the flash to cover either a narrower area or a wider area. Note Not all flash units are zoom units and have this function, also this option will be controlled by the flash when not in manual mode. This is used to switch the flash mode, normally used to select between ETTL (auto) and manual modes. This button is sometime labelled power and allows you to control the output level of the flash when in manual mode, most units support anything from full power to 1/16 of full power, someother units can step down a bit further to reduce the power up to 1/32 of full power. Note – the measurement is a percentage of the full output, 1/1 being full power. This allows the noise and alerts on the flash to be alerted. This turns on and off the flash back light, this is only available on flash units with an LCD screen. This indicates that the flash is operating is full auto mode and directly in sync with the camera, this mode is only supported by the flash being connected as follows. Connected to the camera via a wireless trigger that supports ETTL. Note – ETTL simply means that any adjustments made to the camera will be automatically done tot he flash, such as focal length, etc. This changes the flash from being either the main flash unit in the set to the slave unit, simply put if your flash has this option it can be remotely fired by other flash units, there will be a infrared sensor on yoru flash either the side or front that must be in the line of sight of other units. When the other flash unit fires this unit will also fire. The above is only a guide to the flash units, most work in the same way, but will be laid out differently, but in essence the principles are the same for all. Ok that concludes the basic workings of your flash, the other things to look for in your flash and to know about is as follows. Guide Number – this is the effect distance your flash can cover when your camera ISO is set to 100, normally expressed in feet ie 48 feet. Gels – these are attached to give the flash a colour light rather than the typical white light, if you look at reflector photo above you can see it is back lit in blue, this is done using a gel. Purpose built continuous lights, unlike stobes these do not cycle with your camera. Anything else you like that gives off light. The shot above shows use of other forms of continuous lighting, again it is only limited by your imagination.